With a name like VPN.Asia, you can’t help but think they are trying to appeal to Asian markets. I found the name to be a little misleading. I questioned whether or not they only hosted VPN servers in Asia, but fortunately, they have servers all around the world. I think they’re trying to appeal to Asian demographics because many Asian countries have extremely strict governmental censorship programs. They are owned and operated by Virtual Performance Group Inc., and are based out of Belize. Because they are based out of Belize, they are free from the pressure of governmental agencies like the NSA. As we’ll discuss, I was happy to discover that they have a well-rounded service and modest pricing. There’s a lot to love regarding their service, but no VPN provider is perfect. 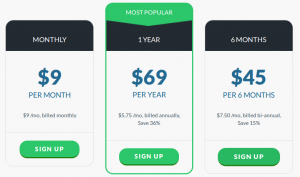 So, before we dig into the nuts and bolts of their service, let’s start by taking a look at their pricing model. Compared to the rest of the VPN market, they’re priced somewhere in the middle. And like most other services, the best value is with the 12 month subscription since they discount the annual plan so much. Usually I advise people to stay away from the monthly subscription since it’s usually so much more expensive. But for the sake of comparison, note that VPN.Asia’s monthly plan is about the same price as the monthly cost of ExpressVPN’s annual subscription ($8.32). So, I think they have a very reasonable pricing system. Let’s dig into their features. Unfortunately, they don’t have either a free trial or a free version of their service. Instead, they have a 7-day money back guarantee, which isn’t as long as I’d like. Nevertheless, I think that’s plenty of time to test out their service before making a commitment to a subscription. I’d also like to point out that they accept a smattering of payment options including Bitcoin, American Express, Master Card, Discover, PayPal, Diners Club International, and Visa. So, if you want to pay anonymously, you have that option with Bitcoins. First off, it should be noted that VPN.Asia has servers in 29 countries scattered around the globe such as the US, Canada, various European locations, Australia, Southeast Asia, and Hong Kong. Despite their name, they actually operate servers in more European locations than they do in Asian countries. While 29 countries is closer to the mid-market, they will be able to accommodate the vast majority of users’ needs. Because they have servers spread out across the globe, you’ll be able to easily find a server nearby geographically to introduce the least amount of latency to your connection. Furthermore, they have over 142 servers and more than 24,000 dynamic IP addresses. I’m a little sad to say that they only permit 2 simultaneous connections per account, though, so they probably aren’t the best fit for a family. Their website was surprisingly vague about their features, and I got the cryptic error message, “Could not be load blogs,” but I’m pretty sure I get the gist of it. Also, they are a good fit for Bit Torrent users, since they permit P2P traffic over their network. It is likely that they can support P2P traffic since they are based out of Belize. Lastly, they support all the major operating systems including Mac OS X, Windows, Linux, Ubuntu, iOS, and Android. One thing I liked about their service is that they offer both TCP and UDP connection options. UDP is faster than TCP because it lacks acknowledgements, making it better for intensive applications like real-time multiplayer gaming. 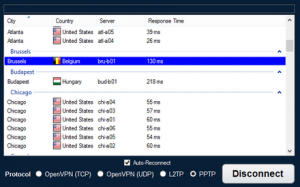 They offer connections using PPTP, L2TP, and OpenVPN. But I would caution users from using PPTP to secure personal information because it is flawed and can be cracked. PPTP is really better used for gaming and unblocking geo-restricted content. When using OpenVPN, users can enjoy the security benefits of AES-256 encryption, SHA-256 authentication, and 2048-bit RSA. Put together, these protocols offer an extremely high level of security. When using L2TP, users can also take advantage of 256-bit encryption, though PPTP only has 128-bit encryption. As stated previously, VPN.Asia is based out of Belize. As such, they’re not bound by bureaucratic data retention laws and regulations, so they don’t keep any logs of user data. Overall, VPN.Asia offers above average security and privacy. And they’re a good option for people who are fearful of the US government. I barely lost any download or upload bandwidth at all. And don’t think there’s such a thing as a provider who doesn’t impact overall bandwidth; VPNs carry the burden of overhead, and will always slightly impact performance. But VPN.Asia didn’t impact performance at a noticeable level. The ping times to both the speed test server and Google DNS were rock solid. Not only were they on the low side (lower is better with latency), they were consistent and even. There was no packet loss or variability in latency (which is also called jitter). I didn’t have any problems browsing the web or streaming YouTube videos. I was even able to login to my Netflix account when connecting from another US server, which was encouraging. All in all, they had fantastic speed and reliability. Like any other competent digital service, VPN.Asia provides 24/7 support to aid customers with everything from account problems to troubleshooting the software. They have a ticketing system that doesn’t require you to be logged in to your account in order to open a ticket. In addition to the contact form on their website, users can also open a ticket by sending them an email. No telephone number is listed on the site. But one thing I really liked was their live chat feature. I’m not sure why live chat hasn’t become the norm, and not every VPN provider has live chat. It just makes it simpler to access a support technician, and circumvents the need to wait on hold and listen to awful music. If you have configuration, connection, or software issues, a support representative can use TeamViewer to remotely configure and troubleshoot your problem. I’ve even seen a rare few other services charge extra for premium support. But VPN.Asia includes these support features for free with every account. In addition to great customer support, their website has setup and configuration guides for just about every mainstream operating system. The guides outline each and every step of the process with high quality images, and they’ve gone ahead and highlighted the fields you need to fill in and the buttons you need to click. And they have the usual FAQ section as well. All in all, I think VPN.Asia has customer support that is higher quality than most other VPN providers. So, is VPN.Asia good or bad? Well, that question is as easy to answer as the question, “How long is a piece of string?” On the whole, I was very pleased with their service and impressed with server speeds. I also really liked how low their monthly price was with the annual subscription. They may or may not be the best option for you, depending on your needs. But I’ll say this: you could do a whole lot worse when selecting a VPN provider. I would have preferred them to have more servers and global locations, but that’s just a personal irritation that is soothed by their favorable pricing. I’d recommend this service, because I think VPN.Asia keeps up with the leaders in the industry. If you’re not sure, I’d recommend trying out their service. You can always take advantage of the 7-day money back guarantee if there’s something you don’t like about their service – but I doubt the majority of users would be dissatisfied.